This $725 AT&T exclusive proves two screens aren't always better than one. Rather than leave the idea of a dual-screen phone in the dustbin, ZTE ran with it and last month released the Axon M, an AT&T exclusive. It's hard not to look at the thing as a $725 curiosity, but don't be fooled: It's a lot more than that. It's an argument that smartphones can and should be more than the flat slabs we've grown so used to. Too bad that argument isn't compelling. Having twice as much screen as usual may seem tantalizing, but chances are you won't be using both displays all the time. When it comes to using the Axon M as you would a normal phone, the compromises ZTE had to make become especially conspicuous. When closed, the phone is half an inch thick, making it the chunkiest smartphone I've tested all year. Now, I'd gladly trade smartphone sleekness for better battery life, but the Axon M uses a 3,180mAh cell that's enough to get through just a single day and not much more. Bear in mind, that's when you're only using one screen at a time; prolonged multitasking all but guarantees you'll need to keep the charger handy. And then there are the screens themselves. ZTE went with two 5.2-inch LCD panels: one baked into the phone's chunky body and another wedged into a sliver of metal that flips arounds on a hinge and locks into place with a satisfying click. Sadly, these displays are wholly unremarkable. They're middling 1080p panels with lackluster colors and decent viewing angles. Neither of them gets as bright as other devices I've tested this year. For a phone as uniquely screen-focused as this one, it's disappointing that ZTE didn't go with more-impressive panels. It's not hard to see why, though: The Axon M would have been even more expensive. While the Axon M's flip-open design might initially seem clever, in practice it's flawed. When closed, both of the Axon's screens face outward, sort of like an inside-out Nintendo DS. Even the earlier Echo device, which was otherwise a resounding failure, kept its second screen protected. The hinge is also wedged into the right side of the phone, forcing ZTE to stick the volume rocker, power button and camera key on the phone's left edge. This runs counter to just about every other smartphone out there, and even after weeks of use, I still haven't gotten used to this layout. Since there's a screen on the other side, you'd think there would be a way to use it as the main display, so the phone's controls are on the usual side. Nope! You're stuck with ZTE's awkward design choices. In daily use, the glass covering both sides of the phone makes it surprisingly slippery. And since both screens always face outward, there's twice as much screen to shatter when the phone does take a tumble. Going off the number of busted phones I see in use every day, I'm already concerned for Axon M owners. After all, if you screw up one of the screens, you've basically destroyed the only reason to own this phone. The screens are also flanked on the top and bottom by some thick bezels, though that was probably unavoidable -- after all, the engineers had to stick the mediocre 20-megapixel camera somewhere. The camera is always pointed straight at you, and you use the second screen around back, then fire up the camera app. It's a clever approach, but image quality is middling at best -- a far cry from the performance you'd normally expect from a $700+ phone. Honestly, one of the few nice things I can say about the Axon's design is that the phone feels sturdier when it's fully open than I had expected; the two screens sit flush with each other, and the hinge feels strong. To actually make use of both screens, you'll have to tap the "M" (you know, for "multitasking") key next to the standard navigation keys. This is where things start to get wild. In addition to using the Axon M as you would a normal phone, there are three ways to make use of that extra screen. You can mirror the contents of one screen onto the other, so you can, say, watch a YouTube video with someone sitting across from you. There are some theoretical business use cases too, such as propping the phone up like a tent and walking someone through a PowerPoint presentation, but this is easily the most forgettable of the Axon's multiscreen modes. Dual mode, which gives you the power to run two distinct apps on their own screen, is more obviously useful. It's a year old at this point, but Qualcomm's Snapdragon 820 chip plus 4GB of onboard RAM keep pairs of apps moving with respectable fluidity. Occasional instances of lag are to be expected, but giving two apps screens of their own generally works well. You definitely shouldn't run two games side by side, but everything else is fair game. I've taken to leaving YouTube running on one screen while I dash off emails in another. And trying to get through The New York Times Saturday crossword puzzle isn't so difficult when I have Google search results for tricky clues beneath it. For all the quirks and strange design choices, multitasking on the Axon M can be useful. Here's the rub, though: The primary way people multitask on their smartphones is by jumping in and out of different app windows, and despite everything, we've gotten good at it. As a result, I quickly ran out of reasons to run different apps on these screens. After a while, I was doing it just to do it, not because using both screens made me any more efficient. The coolest -- and most problematic -- option is what ZTE calls Extend mode. 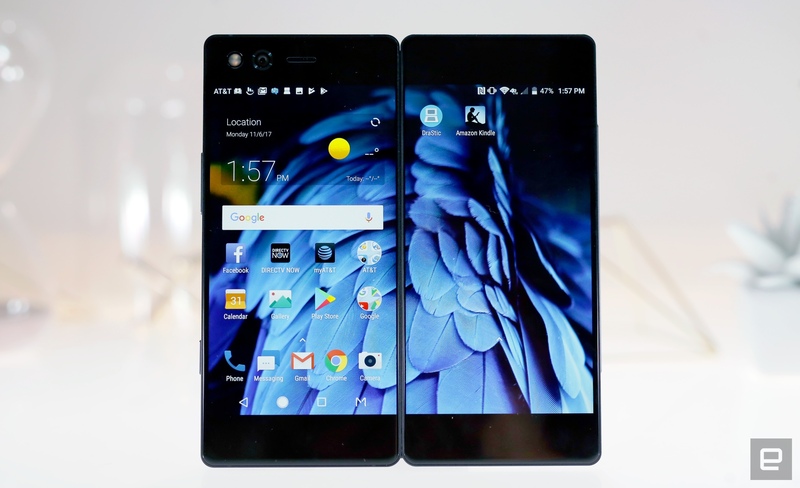 Through some clever software trickery, the Axon M treats the two displays as one big one, and the effect is generally impressive. When the phone's screens are side by side, you'll get a perfectly square 6.2-inch screen that handily blurs the line between phone and tablet. The only downside: a noticeable gap separates the screens. It's a constant reminder that major tech companies still haven't mastered the kind of foldable smartphones we're excited about. ZTE worked with software developers to optimize some apps for this larger canvas, but to get the most use out of it, you'll need to toggle a setting that forces all apps to stretch across those screens. To ZTE's credit, I haven't run into any showstopping issues, but you should expect a few hiccups. The most glaring occurs when scrolling through content that spreads across both screens. The secondary display sometimes lags behind the main one, so it's not uncommon to see one half of, say, a news article moving faster than the other. The irony here is that even though the Axon M has two screens, videos that stretch across them don't appear much bigger than they would on a single phablet screen. Let's say you're watching an episode of Stranger Things. With the Axon M set to extended mode, the size of the video spread across both panels is roughly equivalent to watching the same episode on an iPhone 8 Plus. "Roughly equivalent" is pretty generous too: The sizes of the video windows are close to equal, but you'll never unsee the gap that separates the Axon's two screens. In fairness, neither ZTE nor AT&T have claimed this mode is a particularly great way to watch video, though it's a little odd that the phone has a "TV mode" that launches a predefined video app with a long-press of the camera key. The awkward way the Axon M handles video is proof that two screens aren't necessarily better than one. Still, that's not to say the Extended mode is useless. I stopped carrying my Kindle around because I could just flip open the Axon M, fire up the app and thumb through a novel on the subway. The combined size of the two screens eclipsed my Kindle Voyage, and thanks to apps like InPen's Reading Mode, the Axon M doubles as an e-reader without much hassle. In fact, this is probably what I used the Axon M for the most. That said, the idea of shelling out more than $700 to make reading slightly more pleasant is a silly one. I'm wading into iffy legal territory here, but the most fun I had with the Axon M came when I used it to play backed-up Nintendo DS games. (A note to our lawyers and Nintendo's: I own physical copies of all the games whose ROMs I loaded onto the Axon M.) In those moments, when I could lose myself in a game I'd beaten countless times before, the Axon felt like something special. Then I'd exit the game and find myself left with this ambitious but flawed machine. By now, it should be clear that you don't need this phone. There is, however, something to be said for chutzpah. In building the Axon M, ZTE has displayed a kind of disregard for the smartphone status quo that is both interesting and genuinely refreshing. This might be a concept we've seen before, but there can be no progress without experimentation. If nothing else, this attempt at a dual-screen phone is much more well-rounded than the first. Ultimately, though, the Axon M feels like just that: an experiment, albeit one that's as promising as it is frustrating. I'm glad it exists, just not enough to go out and buy one myself.